A close getaway for us Bangalore folks, Kabini is that place of peace, quiet and adventure. So really, it’s a place for all kinds of travellers. That said, if you’ve made it there, then you should really check out these five activities when in Kabini. Be it on a coracle or a motor boat, a ride on Kabini’s eponymous river is essential. If you’re keen on photography, make sure to take to sit out the outside of the motorboat, and in the coracle, well, be a bit careful as it can get a bit wobbly. Animal and bird sightings are sometimes tough on the boat safari these days, but it’s totally worth it if you catch the evening ride, for the sunset. Just lovely. Part of the Karnataka government tourism board, the jeep safaris are a great way to explore the jungles. Apart from bird-sightings, the elephant, deer, gaur, peacocks and peahens, there’s always the hope of catching the big cats. So look out for those elusive tigers and leopards, they’re not always as rare as you think! While you may not think of coffee and spices at Kabini, it’s really quite close to Coorg. Just on the border of the Kabini region is Kutta, a little hamlet that’s pretty as a picture. 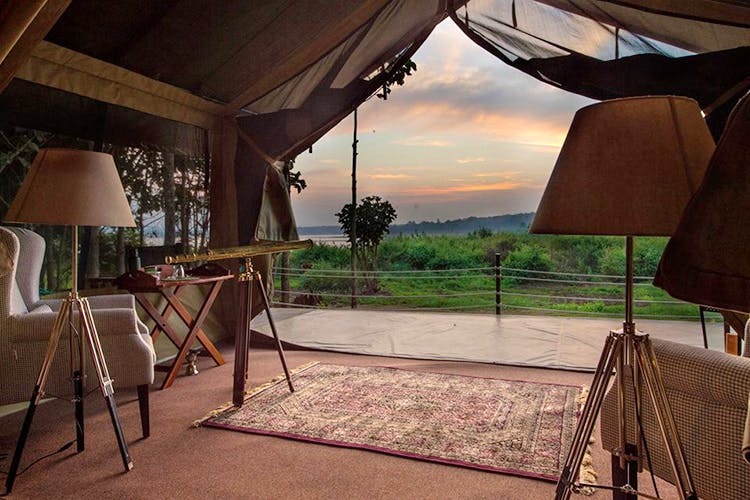 A stark change from the jungles and low-lying waters of the Kabini, this place is all about mountains, coffee plantations, pepper vines and spice trails. Perfect for some rejuvenation. For a rustic stay here, pick Pepper Trails. Check them out here. Our favourite resort in Kabini, though it’s a tad expensive, The Bison is for when you want to splurge a bit. Once you do though, you’ll never want to stay anywhere else. Apart from the luxury tents, the gorgeous views, fine service, sign up for a Theme Bush Dinner. Set up on the banks of the backwaters, you and your SO will be pampered silly by your personal butler who will make sure you’re cosy around a bonfire and food and drinks are brought to you. Soak up the romantic atmosphere with lanterns twinkling around you, and nothing but the grasslands and sounds of nature for company. Now this one is just for you adventurists. Even if you’re not much into cycling, Art Of Bicycle Trips will sort you out as you can customise the number of days, and fix how much you can or cannot cycle each day! It will include riding along the river, up to the dam, exploring little villages and biking through forested areas too, at time. Sign up with Art Of Bicycle here.